Taste test: Turkey-flavored potato chips are a whole new concept for me, so when I was given this bag, I had no idea what to expect. Well, whoever thought of it, nice job! These chips are awesome. They really do taste like turkey with gravy, and the taste is quite good. It's like combining the best parts of Thanksgiving dinner, all in one bag. Once you've eaten one, it's really hard to stop eating them. Yum. Smell test: Smells sort of like turkey with gravy. Nice. Not bad at all. 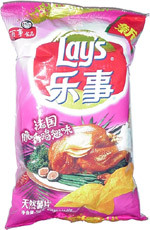 This snack was discovered by Aaron in Shanghai. Review published .